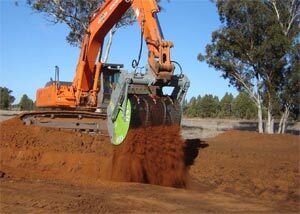 The FlipScreen is a unique, miniaturized screening device, which can be fitted to any sized machine used in the earthmoving, demolition, mining, quarry and fertiliser plant industries to name just a few. 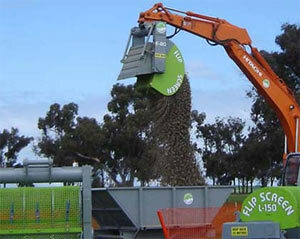 A bucket with a mesh sector on top is rotated to allow the finer particles of the bucket contents to be screened out. At the end of each revolution the contents are stopped by a baffle, which holds the contents until the bucket is further rotated, wherein the opening to the bucket is then facing upward. The contents then spill over the baffle and restart their journey around the mesh section of the bucket. This rotation is continued until the smaller particles have all been screened out. Rotating the bucket in the opposite direction then ejects the larger particles. The FlipScreen is basic in build and consists of high strength steel, hydraulic components, mesh or perforated metal, and standard earth contracting tools. Below are photos taken of our FlipScreens at a recent trade show. 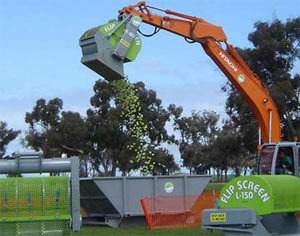 To demonstrate the unique and effective action of the FlipScreen the E80 FlipScreen (shown in operation) screened tennis balls from a large container of sand. 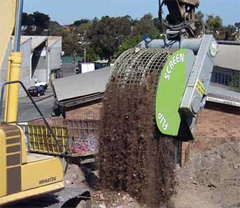 Like the E130, E80 Excavator FlipScreen can be used to screen any material able to be scooped up by an excavator - including rock, sand, steel, rubbish, road gravel, manure, demolition material and compost to name just a few. The E80 FlipScreen can easily be fitted to any 18 ½ to 25 tonne excavator and can be used in the same manner as a general purpose bucket. 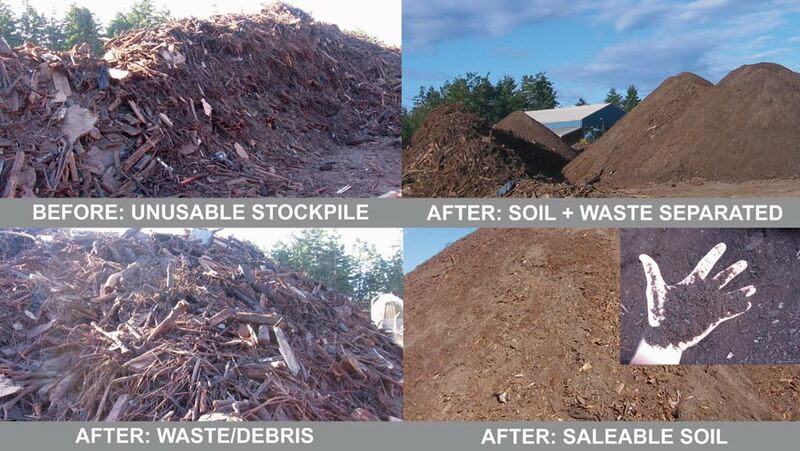 The E80 FlipScreen is ideal for contractors wanting to increase their productivity and can screen around 600 tonnes of material a day depending on mesh size. Any sized mesh can be fitted to the E80 FlipScreen and meshes are easily interchangeable – requiring only one person and no tools. The E80 FlipScreen’s simplistic design ensures that it is extremely robust, requires minimal maintenance and is very gentle on the excavator. Screen sizes: 3/4" up to 6"